As a sales manager, you’ve probably had to contend with difficult salespeople from time to time. Attempting to motivate, encourage, organize, and enforce systems while juggling the needs and demands of the personalities on your staff can feel like an intricate game of chess. Chess is hard enough as is, but when the chess pieces are actually diverse humans with different personalities things can get really tricky. Usually, these difficulties are rooted in a salesperson’s placement in the wrong environment, with the wrong manager, or the wrong motivational approach. As a sales manager, how can you ensure that you place the right people in the right positions? How do you handle each type of difficulty that occurs? 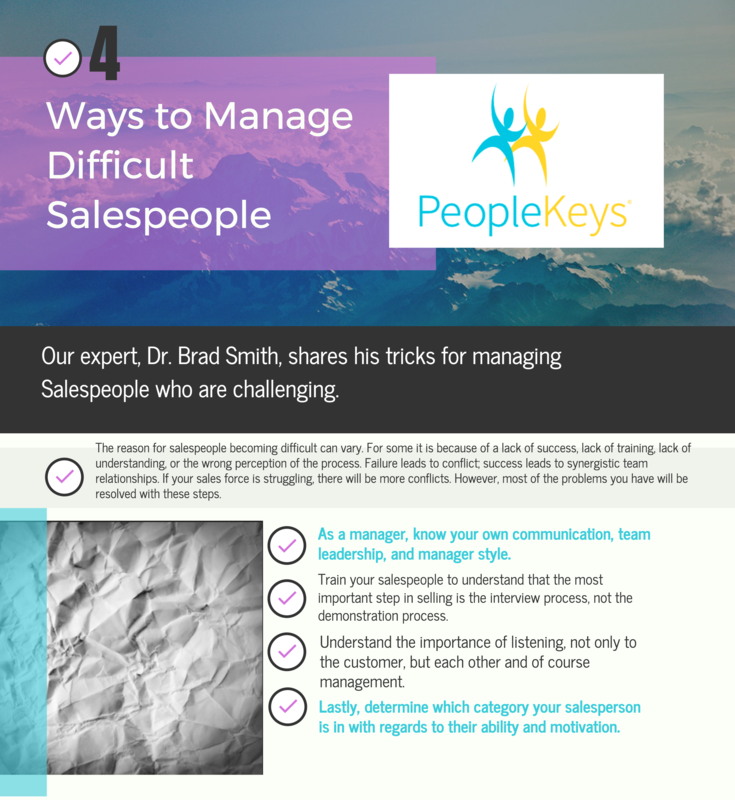 To do this, you have to begin by identifying what types of difficult salespeople you have. To learn about the first two styles of salespeople, check out part 1 of this blog series. Let’s just group this style with the "I Know More Than You" style because they normally go hand-in-hand. These are often very confident salespeople, but they lack substance and depth. Because they know more than even their boss, and seek high personal freedom, they seldom listen and often overlook important things in the sales process. This type of difficult salesperson, along with the "Strong Forceful Closer," will have the highest percentage of dissatisfied customers after the sale. They don’t truly understand their customers needs, so they often sell them the wrong product. The rule of thumb is, for every satisfied customer, they tell one or two of their friends about your product. However, an unhappy customer will tell 10 of their friends about the bad experience. These types of salespeople, while appearing successful at times, can actually cost you a lot more business than you will ever know. Before we get to strategies for dealing with these salespeople, we need to look at the specifics of the "Hard Working but Non-Productive" salesperson. I once hired one of these, and when I checked their references their former boss said, “They put in more hours and work harder than anyone else in the sales department.” The fact they were no longer there should have been my first hint they were not productive, but that was many years ago before I understood behavioral patterns and management strategies. Sure enough, they put in more hours and always seemed busy, but never sold. This person may not know what they need to do to produce, so they exhaust themselves by spending their energy on the wrong things. The strategies for dealing with any of these sales styles come down to some key principles. If you work through these strategies and you don’t have resolution, then you may need to consider ending the relationship. The reason for salespeople becoming difficult can vary. For some, it is because of a lack of success, training or understanding, or the wrong perception of the process. Failure leads to conflict; success leads to synergistic team relationships. If your sales force is struggling, there will be more conflicts. However, most of the problems you have will be resolved with the following steps. As a manager, know your own communication, team leadership and managerial styles. First, understand yourself; then understand the people working for you. There are many tools on the market for doing this, I personally use an instrument called the 3D Assessment which has 3 dimensions and angles of approach for looking at yourself and others. To be an effective leader, you must communicate effectively, understand team and group dynamics, and understand the workplace values of those you are managing. Make sure any tool you use for this is valid, reliable, and has benchmarks for measuring a person’s performance. The one I recommend also has international studies, which helps you to understand how one's culture also plays a role. Train your salespeople to understand that the most important step in selling is the interview process, not the demonstration process. Most good salespeople know there are steps in selling. These are comprised of prospecting, acclimating (getting to know your customer), the interview, the demonstration of the product, overcoming the obstacles for the sale, and then the negotiation/close. Many salespeople do not interview. In fact, all the personality styles will be weak in this area unless trained to do otherwise. Why is it so important to interview before demonstrating? Look at my television example from Part 1. If the salesperson would have asked a few questions before showing me the product, he would have known I had already made up my mind and my choice was narrowed to one of two options. The salesperson did not obtain this information and, worse, didn’t listen when I tried to tell him this. He skipped the interview and only demonstrated -- A fatal error in sales. And, his competition ended up getting the deal. Understand the importance of listening, not only to the customer, but to each other and of course management. I teach a model called the LIST(en) model. L stands for Listen (obviously). This doesn’t mean just letting someone else speak, it means you need to really listen to the meaning behind what is said. Then, Indicate understanding by repeating what they said or giving words of affirmation. Statements such as “so I understand you really like these two models the best” can work wonders. Next, Solicit more information. Ask things such as, “If I could show you other models with other features would you be interested?” In the TV example, my answer would have been, “No, not really.” Only after you have gone through the L,I, and S processes should you Tell or Talk to them about products or closing. Lastly, determine which category your salesperson is in with regards to their ability and motivation. This will give you an idea of your chance for success in working with your difficult salesperson toward a solution, and whether this investment in time and energy will pay off. Your best people will always have HIGH Commitment (motivation) and HIGH Competence (knowledge). Your next best style is HIGH Commitment, but low competence. This is just a matter of more training. It is sometimes much easier to train someone than inspire to the un-inspired. Next best, but not necessarily good, is a LOW Commitment but HIGH Competence employee. This may be the salesperson who "knows it all" or wants to do things "their own way," not the team way. Understanding your own leadership style and their sales style will greatly aid you and this employee towards improving both your relationships and their commitment. Last, and these are the employees you probably want to sever ties with, is the LOW Commitment, LOW Competence employee. My suggestion for this is that you put a more comprehensive hiring process in place to never hire this style to begin with, or to avoid hiring them in the future. Believe it or not, sometimes these people can interview well (because they want to get the job) so it is especially important to use some of the hiring tools that are highly validated, recommended and used, such as PeopleKeys' talent management solutions. There are many ways in which increasing your understanding of your style and the styles of your employees can help to minimize conflict and increase productivity. DISC theory based assessments can help you to narrow down what personality styles your salespeople have, and, subsequently, how to use this information to help them succeed. There are several key strategies that can be used in dealing with the difficult salesperson, which will simultaneously increase your own team’s performance. I have worked with all styles of managers and salespersons, and there is not a definitive right or wrong style. The best salesperson is the one who can adapt to their client’s buying style. Read more about how to Mirror Other Personality Styles to Gain Trust.